I watched the last Miyazaki film, Kaze Tachinu or The Wind Rises, it is about the designer of the legendary zero fighter of the Japanese Empire, Horikoshi Jiro. I went to the earliest one in the morning, but the theater was already full. Wow, the world renowned director Miyazaki is! But to be honest, this film was not that great. It was okay, so so, still enjoyable though, but not as good as The Garden Of Words. But it wasn’t boring either. Usually I get bored after an hour and half passes, two hour feature films are very hard for me to stay still and watch till the end, I lose concentration, probably short attention span I have, my mind starts to wander off. But this longer than two hour Miyazaki film, I didn’t feel bored surprisingly. So, I think this film wasn’t bad. But I didn’t think it was great either. What I can tell from this film is that Mikyazaki already passed his prime. His golden age was the 80s, Laputa and Naussica, Kiki’s delivery, Whisper of Hearts, Totoro, Porco Rosso, to name a few. But from Mononoke, it got boring. It was hard to understand too. Spirited Away, voice actors are not Seiyuu, so I couldn’t get emotionally connected to the film. And also, no excitement, and the question of “so what” occurred in me. The war period film is very controversial politically and historically. Right wing newspapers and magazines trashed that film. And I don’t know why some otaku are right wingers. How can they love a community that has mistreated them? Now, Japan can say No as Ishihara dreamed, and Japan said No to me, so that’s why I came to the states. Today, whenever I watch niconico, net-uyo (internet right wingers) are very hostile, they always comment with a derogatory word on Koreans, “Chon.” It’s troubling. I’m not a right winger, but I’m sub-culturally patriotic. On the way to Akiba, I went to Yasukuni, because it was really close to Akiba. And Yasukuni had a war museum that displays a zero fighter. “Oh, this is the one Horikoshi designed,” I thought to myself. Yasukuni shrine was built by the Emperor Meiji. And also as an otaku, we can’t forget that Akiba shrine was built by the Emperor Meiji. And, Akihabara was named after Akiba shrine, so Akihabara was made in the Meiji period. Yes, the Meiji Emperor made Akihabara, now the mecca for otaku and anime, and maid cafes. So going to Akiba is more patriotic than visiting Yasukuni. Yes, as a subcultural patriot, I also visited Akiba shrine that a miko or shrine maiden, Rukako of Steins;Gate serves for, or should I say “a shrine trap”? Yes, Rukako’s shrine was built by the Meiji Emperor. But I couldn’t find Rukako anywhere in this shrine, probably because it was Kannazuki (non-god month, i.e., October). Yes, Kannazuki-no-miko, that was a horrible yuri anime, incomparable to Marimite or Strawberry Panic! or Sasameki-koto. But yes, Rukako is definitely a character that has made me doubt my sexuality. Zhe is even more feminine than Hideyoshi, whom we will commemorate on Okama Day as sub-cultural patriot. Or should I use “matriot” since I’m a feminist? Miyazaki’s choice of voice casting for The Wind Rises was poor. Simply Anno can’t act. Only Anno has distinctively non-professional voice and manner of speech, thus I couldn’t get into the film emotionally. While other talked naturally, his voice was awkward and didn’t fit in. As if only the main character Jiro had a speech problem. So, that made the film really horrible. It was dissonance. I can’t even bear to listen his voice, it totally killed the atmosphere of the film. Anno as the disciple of Miyazaki, also the creator Neon Genesis Evangelion, is now doing voice for the last Miyazaki film, so that was also what made this film trendy. I wanted to see how Anno does the voice, but turned out to be horrendous. Yes, Miyazaki’s golden age was when he made Laputa and Nausica. Now, his films are getting boring and lame. I don’t know why Spirited Away won the Oscar. Haku’s voice was somewhat lame too, but now Haku’s seiyuu made a huge improvement, and he did voice for Takao of The Garden of Words. Yes, that acting was fantastic. That torment of a high school boy longing for a beautiful female teacher, that was soo right on. I think Shinkai Makoto should get nominated for the Oscar next year! Okay, the story, I think story itself was good. Too bad voice casting killed it. But very sad. Yes, tragic. I’m never married in my life, well in 2D, I’ve been married and divorced a lot, to a girl like Krista, to name a few, but in 3D, I never had ore-no-yome (wife), so I don’t know what is like to lose a spouse. I never had someone that close to me in real life. Oh yes, it’s different from losing girlfriend I suppose. An anime about losing a girlfriend was Kimi No Nozomu Eien. But I experienced losing friends a lot, not because they died of wars or disease, probably due to some miscommunications, but you know, I can’t really know the reason since they leave without telling me anything, so no chance to amend and repair friendship. Well, what can I say? Whoever they want to hang out is totally their choice. Losing guy friends, it won’t hurt that much, well it still hurts, but when losing female friends, that would be a disaster. Female friends are really precious and valuable, female friend is worth zillion times more than guy friend. Yes, to otaku like me, not girlfriend, but even just female friends are imo (intimate girl: wife, girlfriend, sisier, female friend, etc), the etymological word for imouto (little sister). So, basically, this historical word “imo” tells how much a girl close to you means a lot. So, the loss of female friend or wife, both are the loss of imo, so it is tragic. So in that sense, this film can be still relatable. But as a romantic story, or story of koi or ko-hi (lonely sadness = saudade or sehnsucht), so far Shinkai’s film is the best. I had that experience, losing a beautiful teacher, that still rings in my heart of adolescence, 17 forever. So, I think the period has already moved from Miyazaki to Shinkai. But I want to give an applaud to Miyazaki’s last film of his career. Just like we did after the film ended at the theater. 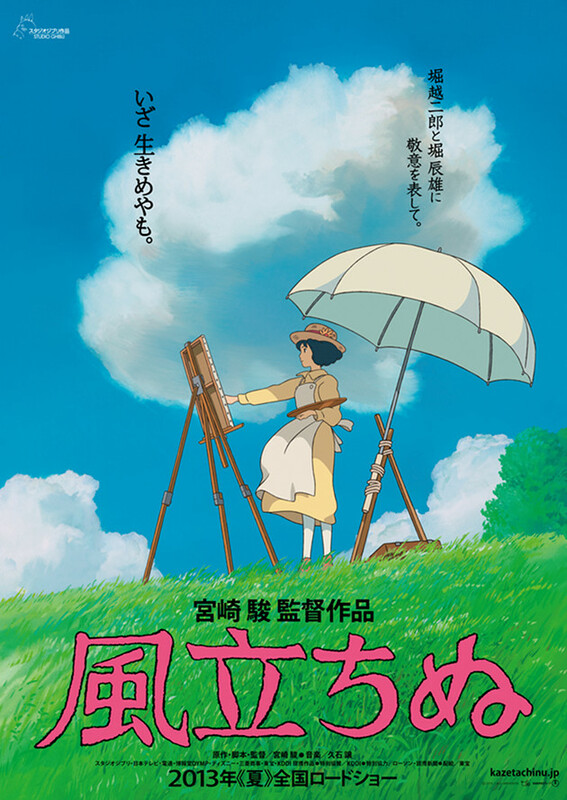 The Wind Rises, the skirt rises. We shall live!